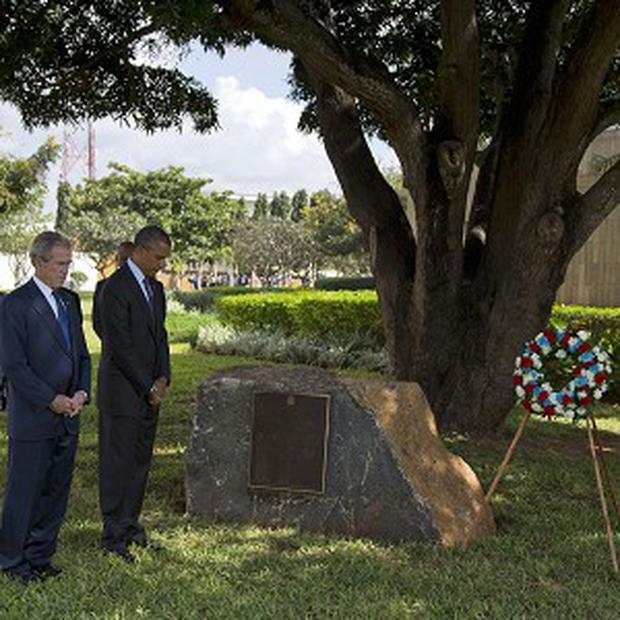 US president Barack Obama and former president George W Bush have laid a wreath at a memorial for Americans killed in the 1998 bombing of the US embassy in Tanzania. It was a rare joint public appearance by the pair. Both men bowed their heads after a marine placed the wreath on a stand during a ceremony in Dar es Salaam. They shook hands with victims and their families and walked back to the embassy together. The ceremony lasted just a few minutes and neither man made any public comments. Tuesday's embassy visit is one of the last stops on Mr Obama's week-long tour of the continent. Mr Bush's institute is hosting a two-day summit on African women.